The API Individual Certification Programs (ICPs) are well established worldwide in the oil, gas, and petroleum industries. 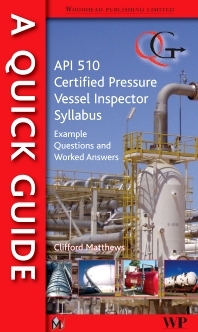 This Quick Guide is unique in providing simple, accessible and well-structured guidance for anyone studying the API 510 Certified Pressure Vessel Inspector syllabus by summarizing and helping them through the syllabus and providing multiple example questions and worked answers. Technical standards are referenced from the API ‘body of knowledge’ for the examination, i.e. API 510 Pressure vessel inspection, alteration, rerating; API 572 Pressure vessel inspection; API RP 571 Damage mechanisms; API RP 577 Welding; ASMEVIII Vessel design; ASMEV NDE; and ASME IX Welding qualifications. Interpreting ASME and API Codes; An Introduction to API 510 (Sections 1–4); API 510 Inspection Practices (Section 5); API 510 Frequency and Data Evaluation (Sections 6 and 7); API 510 Repair, Alteration, Re-rating (Section 8); API 572 Inspection of Pressure Vessels; API 571 Damage Mechanisms; API 576 Inspection of Pressure-Relieving Devices; ASME VIII Pressure Design; ASME VIII Welding and NDE; ASME VIII and API 510 Heat Treatment; Impact Testing; Introduction to Welding/API 577; Welding Qualifications and ASME IX; The NDE Requirements of API 510 and API 577; The NDE Requirements of API 510 and API 577; Thirty Open-Book Sample Questions; Answers; The Final Word on Exam Questions.